Much needed rain is falling abundantly today as I filter some of my bark tinctures and prepare new ones. Besides the evaporation of bodies of water, like the ocean, rain also is composed of soil, plants and animals. When the water descends to the earth it contains a valuable chemical element, Sulfur. Sulfur is considered essential to life and provides plant life with important amino acids. Sulfur was one of the two most important substances to Alchemists. 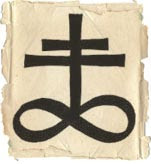 These early chemists considered this element to be akin to the human soul and represented it with this glyph. In many Illuminated works on Alchemy, Sulfur is represented by the image of the Sun. 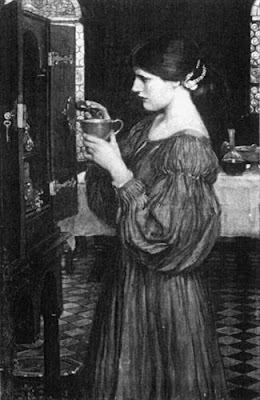 The painting above left is titled "The Love Philtre" by William Waterhouse, 1914.